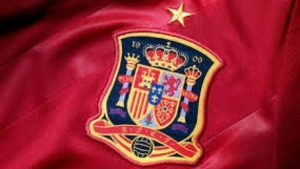 First there was the Spanish football team winning Euro 08. Then there was Rafa Nadal winning Wimbledon. 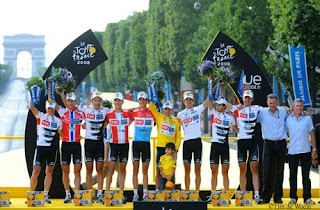 And now, Carlos Sastre has made it a hat trick of Spanish wins, riding into Paris as winner of this year’s Tour de France. After my post on Saturday re my dilemna, I did feel rather sorry for Cadel Evans who lost out to a Spaniard in the time trial last year too (Alberto Contador who was unable to defend his title as his team Astana were not invited in the wake of Vinokourov-gate last year) but he was simply too tired I think to pull it out of the bag. However, I must admit that I was secretly really pleased to see Sastre triumph as he rode out of his skin in the time trial. Not simply because he’s Spanish and from one of my favourite towns (Avila), but because he was SO humble about it all. At every opportunity he praised his team who supported him so well throughout – and they deserved it too. Without the Schleck brothers, Stuart O’Grady, Fabian Cancellara, Jens Voigt (who lost his saddle somewhere on the Champs d’Elysees!) Kurt Asle-Aversen, Nicky Sorensen and Volodymir Gustov, Sastre would have been as isolated and tired as Cadel Evans. He dedicated his win to his brother-in-law, José María Jiménez, who was also a professional cyclist who died in 2004. As Sastre said ‘su derrota era querer ganar esta carrera’ so it made his win all the sweeter for him and his wife, Piedi, Jiménez’s sister. So here’s to Carlos Sastre – ¡muy bien hecho! 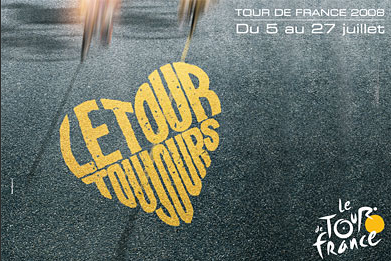 Although I no longer regularly teach French, I still love the annual French phenomenon that is the Tour de France. I used to make a big fuss over it with an interactive map and daily updated chart – I think that was when my NQT year really seemed to reap rewards as the kids at the tough comp where I taught fought to be my ‘updaters’. So the big question is…. who will win? I don’t share the opinion of some fellow Twits who are missing Armstrong and Ullrich – I love the more open race this year. 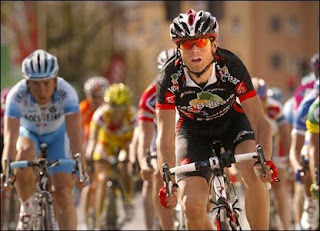 From the start, I’ve been rooting for Mark Cavendish for the sprints and Cadel Evans for GC. With Cavendish abandoning to concentrate on the Olympics – and to give other sprinters a bit of a chance too ;o) – all my supportive vibes have been channelled the Aussie’s way. However, Carlos Sastre is in yellow going into the penultimate stage – what shall I do? He’s Spanish after all! Should I be loyal to my Spanish preferences and yell for Sastre, or to my original choice and scream for Evans to make up the deficit of just over a minute and a half? The likely outcome is a win for Evans as Sastre is not a great time trialler, but anything can happen in Le Tour! But I really can’t see this animation coming true – sorry, Bernhard Eisel – but, just to be on the safe side, watch out for cows, Carlos and Cadel!! 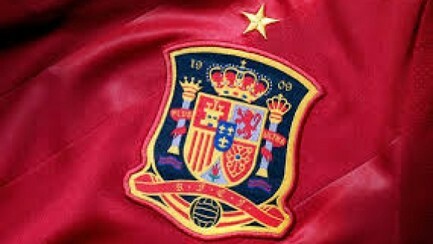 Although Fernando Alonso let the side down, Spain are at it again, winning! On Saturday, Alejandro Valverde opened the Tour de France with a win on Stage one from Brest to Plumelec. And then on Sunday, Rafael Nadal finally conquered Roger Federer on grass at Wimbledon after a roller coaster of a game. Without the good old English weather, Rafa would have won in straight sets, and saved much nailbiting, but we’d have missed an epic tussle between two incredible tennis players. And to cap it all, he became the first player to ever climb into the Royal Box!! 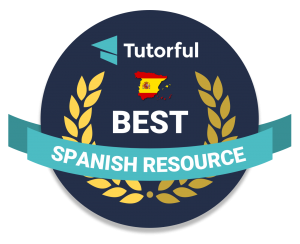 Not sure how Rafa’d feel about the assertion that he’s ‘ante todo, español’ as a proud Mallorquí, but all of Spain is proud of him!